I believe we’ve met. He throws down a shot of cheap Sauza tequila and is clearly slipping. The weekdays are brake lights, dull red orbs that light up to keep from crashing into one another. The only distinguishing mark from one day to the next is its position along the gridlock. Whereas Friday picks up speed, gassing it into the weekend with one last chance to gawk at the week’s mangled wreckage, Monday remains the heart of the jam: the place where it all comes to a halt. A complete standstill. To celebrate the two days (minutes) off, some slip away off exit ramps or detours, tapping into a bottle of temporary, a puff of erasure, or sadly, a sniff or snort of something harder still. But any release—euphoric and quick—is only a mirage, over before it begins, the bottle evaporating into a phlegmy slosh of backwash. Soon, the tequila et al is gone completely. Muerto. Could be a Post Office, a shopping mall, or maybe a McDonalds. Or God forbid, it could be at another school. Although the locations may differ, one similarity remains. That is, some psycho-loser decides he can’t take living inside his own useless skin one second longer but is too cowardly to either seek help or at a minimum go out alone. On the verge of their hundredth nervous breakdown, they hide, drowning in their own fear, suffocating in their own paranoia. They’re invisible to me and you as they dream of CNN stardom. To them infamy is immortality. They’re out there, busy at work composing the next cliché-riddled manifesto for media whores to drool over. Breaking news. They’re nothing. Zero. The end. Leave it at that and nothing more. Anything further would be a waste of ink. Note: On May 31, 2004, tragedy struck the music world with the death of guitarist Robert Quine. Quine was a zelig in the New York punk scene, infusing it with his unique brand of jazz, blues, and rock guitar. In addition to his own solo albums, Quine played with Richard Hell and Voidoids, Brian Eno, Tom Waits, Matthew Sweet, and Lydia Lynch, to name just a few. 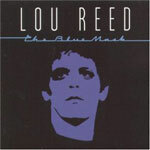 But Quine’s most exciting collaboration came when he joined forces with Lou Reed to help create The Blue Mask. Rocky relationship aside, Reed and Quine whipped together a telepathic tandem, suppressing ego when and where it mattered most—the music.